There are many things we do on holiday that when we return home we might reflect upon and think that they were a bit silly or foolhardy. From basking in the sun for too long to an ill-advised holiday purchase that looks terrible when you get it home, this is something that many of us can relate to. One seemingly harmless holiday endeavour is the henna tattoo. This might seem like a cheap and fun way to try out what you look like with a real tattoo, but a darker side to henna tattoos has been uncovered. For some unlucky holiday makers, a simple henna tattoo has left them with pain and scarring, as the chemicals contained within the henna ink are not suitable for prolonged contact with the skin. Some henna tattoos have also become infected, which can be extremely painful. Sky News recently reported that “traditional brown henna tattoos are usually harmless, but the black ones sometimes contain chemicals, that can react with the skin”. 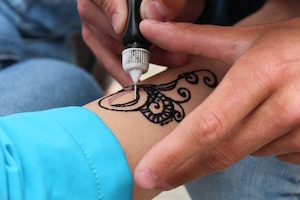 If your skin reacts with the ingredients contained within the black henna, it can mean that the henna tattoo has to be bleached off, meaning that the tattoo stays with you for much longer than a simple bit of holiday fun. This can be painful and leave lasting scars which could take years to fade. The advice to any holiday makers who might be tempted with a henna tattoo is to use your common sense. Avoid black henna – make sure it is the natural brown henna that has been used for centuries in some cultures. Also make sure that your henna tattoo is created by a reputable provider. This is not always something you can guarantee on holiday, so if you’re in doubt, give it a miss. If you have scars that have been left by henna tattoos or by any other reason, there are scar reduction treatments that can help. It is never possible to eradicate a scar completely, but a cosmetic surgeon such as Mr Alan Park can evaluate the scar and advise you on the best possible treatment and potential outcome.